“The project is a perfect combination of bicycle and pedestrian activity,” said Denis Bazyuk, assistant engineer with Stanislaus County Public Works. 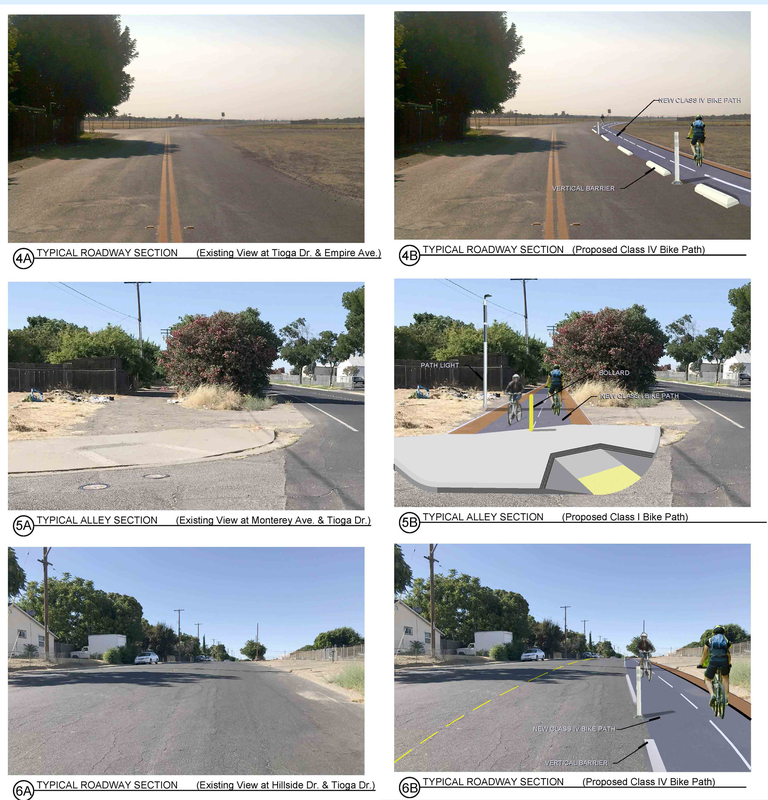 The project also includes a proposed bike route down Empire Avenue from the busy Yosemite Boulevard to Legion Park just past Orville Wright Elementary School, and a separated bike lane on Tioga Road that will connect with an existing bike lane on Hillside and Tioga. Bazyuk said planners were able to negotiate with the Modesto Irrigation District to pave along an old canal line that winds through most of the area, so residents can walk through the neighborhood easier. Edgar Garibay, community relations manager for Tuolumne River Trust, runs a bicycle club that takes students and parents on monthly rides from Orville Wright school to the river. He said the improvements will make it easier for more children to walk and bike to school instead of being driven. They will also provide safer opportunities for recreation, he added. “It will be easier and safer for us to navigate our bike fleet when we have dedicated bike lanes,” he said. Garibay, along with other organizations and agencies including the elementary school, have long advocated for better infrastructure in the riverside community–with some success. Two years ago, the county improved sewers and repaved roadways, and the city installed a four-way stop sign at a busy intersection near Orville Wright school. But lack of resources at the county agency to do more collaborations with partners, and the lack of funding to carry out projects, have prevented more progress. “The simple answer is no,” Bazyuk said, when asked if the county would have been able to undertake the project on its own–and the main reason is funding. Even though Measure L is contributing to the cost, there isn’t enough to complete the project. “We would be waiting a long time,” he said. In fact, Bazyuk said this was the first ATP application the county public works department has submitted. Lack of resources to put an application together and not having projects that fit the mission of the ATP kept the county from participating until this cycle–when it submitted four applications. The county’s experience is not unique. The ATP has been successful in encouraging cities and counties to create and plan projects that encourage biking and walking. As that planning and those projects improve, so do their applications. For this round of ATP funding–Cycle 4–competition was tighter than ever. Staff recommended that the California Transportation Commission fund only ten percent of the projects that applied–55 out of 550, even though there was a sizable increase in the total funding for the program. The San Joaquin Valley was recommended for $20 million to go towards nine infrastructure projects and three plans–a Bicycle and Trails Master Plan for the community of Parlier, south of Fresno; a Safe Routes to School Master Plan for the city of Mendota, west of Fresno; and an Active Transportation Plan for the city of Gustine, west of Merced. There were also more applications for this cycle with higher scores than in previous cycles, reflecting better applications and higher quality projects. All the recommended projects in the statewide competition received at least 90 points on criteria such as the quality of public support for the project, the likelihood of implementation, and whether a project benefits a disadvantaged community. Bazyuk said at least one of the county’s other project applications received a score in the high 80s, which will probably put it in a good position for the regional competition. Recommendations for regional projects will be made this summer. Garibay said the Airport neighborhood project could dramatically change what it is like to live in the area. “It will change outside people’s perspective as well,” he said of the neighborhood that is better known for its problems than its gems like the river and parks.